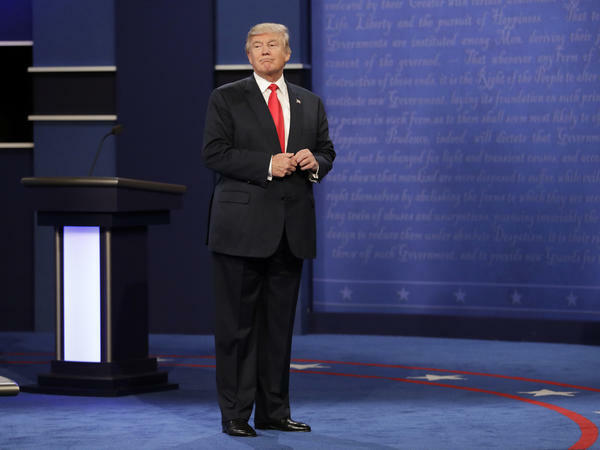 Republican presidential nominee Donald Trump stands on stage after the third presidential debate at UNLV in Las Vegas on Wednesday. In the final presidential debate, Donald Trump said he supports the federal ban on "partial-birth" abortion because, under the procedure, "in the ninth month you can take the baby and rip the baby out of the womb of the mother." He added that this can happen "as late as one or two or three or four days prior to birth." But that is not at all likely. Some 90 percent of abortions take place in the first 12 weeks of pregnancy, according to the Guttmacher Institute, a research group that supports abortion rights. Only about 1.5 percent of abortions take place 20 weeks or later after conception. Of those, the vast majority happen before 24 weeks. Under the current federal ban, a dilation and extraction (D&X), or intact dilation and evacuation (D&E) — what opponents call "partial-birth" abortion — is still allowed if the life of the mother is at stake. Few providers perform it and the exact number of procedures is not known, but it's believed to be small. In fact, at one point, members of Congress tried to ban D&X procedures that would take place after a fetus is considered viable. But abortion opponents complained that would have kept most such procedures legal. So-called partial-birth abortion involves dilating a woman's cervix to remove a fetus intact, pulling its entire body out through the birth canal. In 2003, President George W. Bush signed a law banning the procedure, imposing a fine and imprisonment for any physician who "knowingly performs a partial-birth abortion and thereby kills a human fetus." The U.S. Supreme Court upheld it in 2007. Nineteen states have their own such bans, while 43 states impose some kind of restriction on abortions later in pregnancy. When she was a U.S. senator, Hillary Clinton voted against the partial-birth abortion ban. In last night's debate, she said she opposed it because it did not include an exception to protect the health of the mother. She said she has met with women who learned late in a pregnancy "that their health is in jeopardy if they continue to carry to term" or "that something terrible has happened or just been discovered about the pregnancy." Providers say that often means a severe fetal abnormality. According to the landmark ruling Roe v. Wade, any restriction on abortion must include an exception to protect the health of the mother, both physical and mental. A number of lower courts ruled the partial-birth ban was unconstitutional because it did not do that. President Bill Clinton also vetoed the measure twice. But, in a move that one liberal justice called "alarming," the Supreme Court ruled the health exception was not needed in this case. It said there were questions about the safety of a D&X procedure and that there are alternative ways to terminate a pregnancy. Last night, Trump called the procedure "not acceptable," but that's a change in position. When asked on Meet the Press in 1999 if a President Trump would ban partial-birth abortion, he said no. He said he "hated" abortion, but since he had grown up in New York, "I am pro-choice in every respect."